One Cambridge company has built its success on Kindle. But can it stave off competitors and make good on its vision of revolutionizing everything from credit cards to clothing? The hottest technology company in the Boston area sits in a low-slung 100-year-old converted factory in the West Cambridge Industrial Park, not far from the Concord Avenue rotary. Inside its modest lobby hangs a 2-by-4-foot display. Messages scroll across it: “Welcome to E-Ink . . . the time is now 2:58 p.m. ’’ It’s 30 minutes slow. The sign doesn’t use light-emitting diodes, the standard for scrolling displays. Instead, it was one of the early commercial applications of E-Ink’s electrophoretic technology. Electrophoretics uses electricity to move particles in fluid. In this case, the particles are black and white, positively or negatively charged, and E-Ink’s software manipulates them with electric current to create messages that appear to scroll across a sign or to mimic the look of words on paper. Back in the early part of this decade, when E-Ink was a struggling start-up, the lobby sign showed it had a working product. Today, it reminds us that sometimes you have to fail in order to succeed. Signs nearly put E-Ink out of business. Its first product was a sign, much smaller than the one in its lobby, for pricing goods in retail stores. Retailers could automatically update prices on these signs from a central location via the pager network, saving money and improving accuracy. Only it turned out that lots of stores lay outside of pager range. Ones that were in pager range tended to have steel roofs, foiling the updates. By 2001, E-Ink was nearly out of cash, and in the wake of the dot-com crash, it was difficult to get more. So, according to cofounder and current CEO Russ Wilcox, E-Ink decided to dump all of its projects save one: making the electronic ink and related software for a digital book reader Sony was planning. e-book readers are expected to be sold worldwide, more than quintuple last year’s sales, according to research firm iSuppli. And E-Ink is profitable for the first time in its 12-year history. Microsoft and Google did big things. E-Ink might, too -- it seems poised to do something people have dreamed of for at least 20 years: Replace paper. E-Ink’s technology is behind the screens for 40 different electronic book readers, including Kindle. Today’s Kindle can hold 3,500 books, more than most of us will read in a lifetime. Kindle users can also subscribe to electronic versions of some newspapers and magazines. 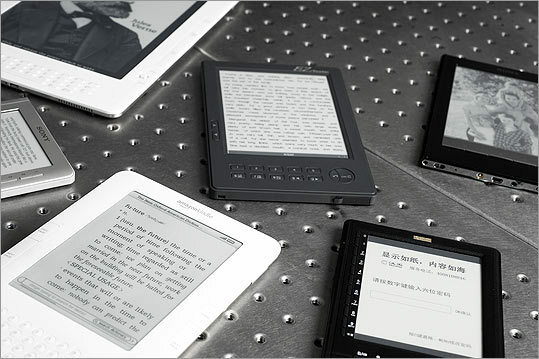 E-Ink holds a nearly 100 percent share of the screens in the e-reader market. The company grew more than 250 percent through the first nine months of this year, notching sales of $96 million. Most of that was from the products for e-readers, but its technology has two other markets. One, segmented displays, appears on products like watches, mobile phones (like the new Samsung Alias 2), store shelves, and even credit cards. The other, ink-in-motion, is used for indoor signage; it also famously appeared as flashing type and images on the cover of limited-edition October 2008 issues of Esquire magazine. E-Ink turns its electronic ink into sheets of electronic paper it calls Vizplex (an amalgam of Visual Plastic Flexible), which looks like a piece of stiff plastic film, light on one side, dark on the other. Software controls the current flowing through the e-paper -- a positive current attracts the negatively charged black particles, and a negative current attracts the positively charged white particles. The company produces Vizplex by the roll in its plant in South Hadley, as well as in Asia. Customers attach it to a display, and though a Vizplex display could theoretically be hundreds of feet long, most of today’s applications have displays of about 6 inches or smaller. On the Kindle and other current e-readers, that display is made of glass. But E-Ink’s technology does not need glass to work. Its backing could be something else, something flexible, even something foldable. Sriram Peruvemba, E-Ink’s vice president of marketing, keeps a mock-up of an electronic newspaper E-Ink once built sitting on his desk. It’s nearly as thin as your fingernail. The paper, dubbed “The Boston News,” is dated September 16, 2005, when E-Ink showed off a prototype. It epitomizes the company’s original goal, to create “radio paper,” which Russ Wilcox calls “an all-singing, all-dancing piece of paper that could give you access to all human knowledge.” At least any knowledge that’s in digital form. Because breakthroughs don’t happen that way. E-Ink makes “wonderful technology,” says Bill Trippe, an analyst at Gilbane Group, a content management research consultancy in Cambridge, but it doesn’t make the products that take advantage of it. That makes it an unlikely darling in the consumer electronics industry. E-Ink does have a chance, though, to become like Intel, or NutraSweet, companies that are best known for making “ingredients” for other products but are also familiar to consumers. For E-Ink to become an Intel-like consumer icon, a lot more than 1 million or 5 million or even 22 million e-books have to be sold. Some analysts who follow the company say it has a bright future, but not an iconic one. Even today, more people read electronic books on their iPhones than on something like the Kindle. Apple may have introduced its own tablet-sized e-book reader by the time you read this, a product dubbed “the Kindle killer” by the press. Microsoft might have shipped its own Kindle killer, a two-screened reader/tablet called the Courier. Such products -- neither of which looks likely to use E-Ink technology -- will do more than just let people read. They will also feature color, which E-Ink has demonstrated but hasn’t launched yet. E-Ink could find itself boxed into e-readers, a market with limited growth. “E-readers are not going to be as big a market as MP3 players,” says Sarah Rotman Epps, an analyst at Forrester Research. The Chill Center sits off the lobby in E-Ink’s building. Natural light streams in from skylights in the peaked roof. Not long ago, the sounds of ping-pong matches and basketball games were heard here, but manufacturing took over those spaces during its growth boom. On a recent day, containers of food and a platter with a few lonely crumbs of cake sit out, left over from a lunch spread the company pays for every other Wednesday. Peruvemba sits down at a clean table and pulls out a thin letter-sized sheet of steel with a sheet of Vizplex attached to it. Along two sides run a few row-and-column display drivers, the electronics that make the display work. He bends the sheet -- it won’t fold -- then puts it on the table. He pounds it with his fist. It doesn’t break. How unlike a computer. He says this is an engineering sample from a customer that will soon ship an e-newspaper built around it. “We are just weeks away from flexible displays,” he says. e-reader this month. Before the end of the year, another company -- that E-Ink won’t yet name -- should release an e-reader for textbooks, which will include illustrations, tables, and other graphics that are difficult to display on today’s e-readers. A successful textbook e-reader could vault E-Ink into stratospheric growth. 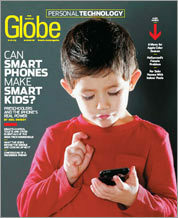 Some schools in the United States are already talking about issuing e-readers to students in place of textbooks. This year, Cushing Academy, a prep school in Ashburnham, replaced its libraries with 18 Kindles. But the real opportunity here, says Peruvemba, is in emerging markets. He says if countries like India and China increase literacy rates by even 10 percent, countless trees will disappear. An e-reader, with its vast capacity for text, could become the centerpiece of a “one library per child” strategy, playing off of the idea being promoted by One Laptop Per Child, with its inexpensive, durable laptops, also based in Cambridge. Rather than selling the readers at retail, Peruvemba foresees people paying a monthly fee, the way they do for cellular phones. Along with bigger screens, E-Ink expects to see customers use color versions of its technology before the end of next year. A sample of its color screen was on display this year at an industry event. Peruvemba says the company also sees an expanding market in using electronic ink to add intelligent surfaces to things like credit cards, appliances, and clothes.